BRISTOL SHOW 2010: Chord Electronics Cyan Click uses Bluetooth for wireless streaming | What Hi-Fi? Chord Electronics is also in on the act, with this, the Cyan Click. It's an integrated amplifier with wireless connectivity using Bluetooth technology, as well as control via digital and analogue inputs. It's a similar size to Chord's compact QBD76 DAC. There are two versions: the 50W model costs £3875, and the 100W version £4215. Bluetooth enables users to wirelessly connect A2DP-enabled phones and their PCs to transmit audio files to the amp without any cables. 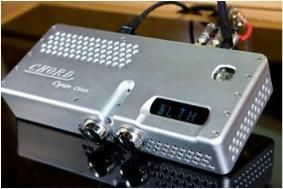 Chord's Click amp includes its custom designed Bluetooth receiver that extracts and decrypts the digital audio data and then sends this directly into the amp's own digital-to analogue converter. The Bluetooth receiver has a claimed range of 30 metres, and is also compatible with the more advanced APTX Bluetooth system. For those who prefer a more conventional wired connection to the amp, analogue sources can be hooked up using the XLR balanced inputs or RCA phone ins. Both can be used at the same time and are independently switchable. Digital connectivity is via a BNC coaxial input, optical Toslink or USB. The latter can be connected to a PC, and any music played on the computer will be digitally decoded and converted to a high-quality hi-fi signal for playback.